One of my stamp club members asked if we could learn a few watercolor techniques. Not having any watercolor experience, I went to that great provider of ideas and techniques, Pinterest, and found what I was looking for! We'll be making three beautiful projects all inspired (or CASEd) from Pinterest finds and using spritzers and aqua pens for each project. Floating Reinkers, inspired by Deborah Smart's card (click here to view). Features Shimmery White cardstock with So Saffron, Calypso Coral, and Crisp Cantaloupe reinkers; the Blended bloom was embossed using Melon Mambo ink, Versamark ink, and clear embossing powder. Cardstock is Crushed Curry, Calypso Coral (embossed with large dot textured embossing folder), gold foil vellum, and a scrap of So Saffron for the sentiment, embellished with gold satin ribbon and gold sequin trim. 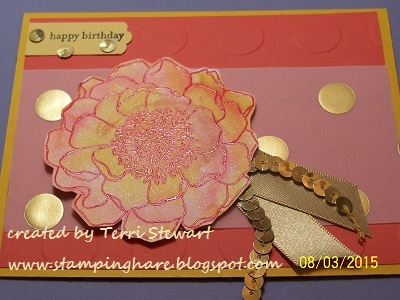 Watercolor with emboss resist, CASEd from Lisa Young's card (click here to view). 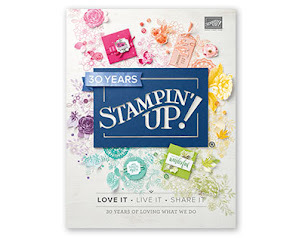 Features watercolor paper with Coastal Cabana and Pear Pizzazz reinkers; images embossed with craft white ink and white embossing powder. The Old Olive leaves were stamped after embossing and watercoloring the background. I used Old Olive cut and scored card base with Black cardstock; I stamped the background in Old Olive ink. Like Lisa suggested, I stamped the butterfly on Typeset DSP in Tempting Turquoise and punched it out. 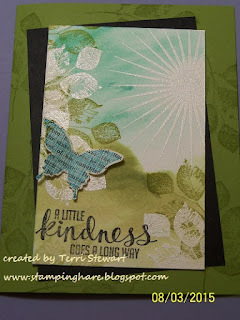 Watercolor and stamping, inspired by Mary Brown's card (click here to view). Features watercolor paper with Pear Pizzazz ink pad; I did as Mary had described--wet the watercolor paper, stamped in Pear Pizzazz, used the aqua pen to wash over those images; next stamped again with Pear Pizzazz but no aqua pen wash. The base is Soft Suede topped with a piece of English Garden DSP; the watercolor panel is adhered on Blackberry Bliss with dimensionals behind it. 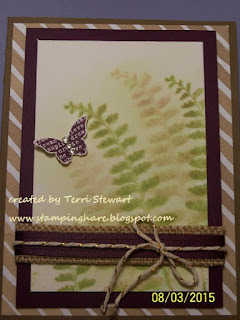 I stamped the butterfly with Blackberry Bliss and punched it out. I layered ribbons---cut the 1 1/4" burlap ribbon in half (5" gave plenty to secure behind the cardstock), 3/8" blackberry bliss stitched satin ribbon, topped with gold baker's twine.